We offer a variety of party packages and room options, and we welcome groups of all sizes. 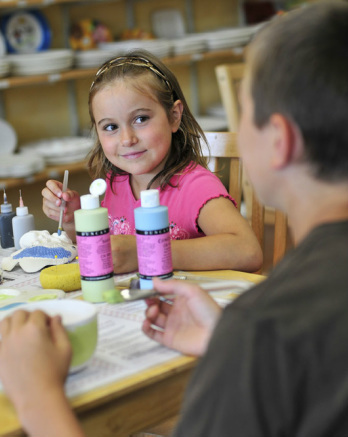 Pottery, clay, and glass parties are available. Get a Private wheel lesson for your birthday party! Make as many projects as you want!! Can take clay piece home after it has been kilned and paint with acrylics, or you can paint with the glazes we have, just pay the studio fee. Choose a theme for your party and pick your items ahead of time — or let your guests select from any of the items in our studio. Needs to be reserved for your party a week ahead. The party room offers a comfortable setting with space for decorations & refreshments. For larger groups, full studio parties are also available. Advance reservations are required for all party areas. Contact us today for more information.